As you’ve likely heard, the longer the food we eat is exposed to heat, particularly at high temperatures, the greater the nutrient loss. The same holds true for pet food. 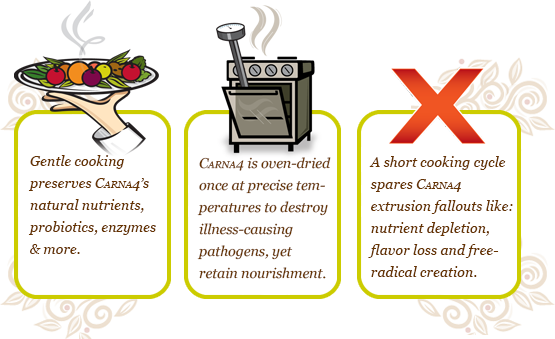 With this in mind, the ingredients in Carna4 are heated only once, for a short period of time and at moderate temperatures. We ensure the ingredients reach 195° F/90°C to eliminate the illness-causing pathogens (e.g. salmonella) that may be present in raw chicken, duck, pork and fish. At the same time, our gentle baking/drying temperature is kept low enough and the cycle is short enough to preserve the naturally-occurring probiotics, enzymes and nutrients your pet needs, along with authentically scrumptious aromas. We deliberately chose oven drying to avoid the high nutrient and flavor loss that comes with extrusion (see sidebar) – the extreme heat and pressure-laden process used to make most dry pet foods. We also avoid another extrusion consequence: the creation of very high quantities of free radicals – byproducts of heat, pressure and abrasion. These charged particles can damage the food’s molecular structure and cause early rancidity. Once ingested, these free radicals can attack your pet’s body cells and if they reach unnaturally high levels, can hasten damage, leading to serious conditions like arthritis and contributing to cancer cell growth. When there is a high concentration of free radicals, antioxidants like vitamins C and E will be reallocated to neutralize them. However, this leaves a nutrient shortfall for preserving the food and meeting other health needs. We’ve found that by gently baking our sprouted seed recipe, we can safeguard our superior supply of nutrients. Our flavor retention and palatability is also so strong that there’s no need to spray on the artificial flavors, fat or digest which extruded products rely on. We handcraft Carna4 in small batches so it moves swiftly from our bakery to your local pet specialty store’s shelf still smelling of freshly baked goodness and with a wealth of nutrients intact. One of the least expensive ways to turn inedible foodstuffs into pet food (or breakfast cereal) is by the extrusion process. 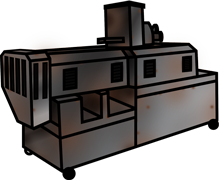 Using a combination of extremely high heat and pressure to incinerate bone, gristle, claws, diseased flesh, and anything else in the bin, the foodstuffs are turned into a sterile, mostly inert mass which can be molded into shapes. There is very little nutrition left after this process, as the life of any original food item is literally cooked right out of it. This may explain why so many processed foods require the long list of synthetic additives often included on their ingredient list.